Palmer revealed the winner of the first British Classic of the season had been categorized as a CC, meaning his optimum distance is likely to be between 5f and 1m. Horses can also be CT, meaning their best distances are between 7f and 1m4f, or TT, where horses are expected to be better over distances of 1m2f and further. 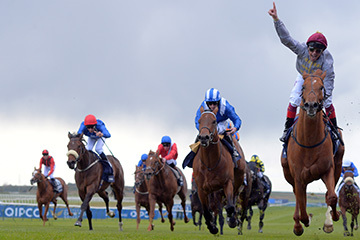 Palmer felt compelled to consider the mile and a half Epsom Classic after the colt's length and a quarter success in the Guineas, but the result of an Equinome test conducted by scientists at University College Dublin have deterred connections. Explaining in his Betfair blog, Palmer wrote: "This means that there is a less than one per cent chance of his optimum trip being 1m4f and therefore, having consulted with Harry Herbert and Sheikh Joaan, I can reveal that the horse will not be running in the Derby. "In many ways this is a relief, as if the results had come back a "CT" then we may have faced a dilemma."